This Beautifully designed Christmas Tree Ornament will bring the True Aussie Christmas Spirit into your home. This adorable little Gumnut Baby Koala Christmas ornament is light-weight, which makes it easy to pack up and send as a gift or for hanging it on your Christmas tree and it won’t weigh down the branches. 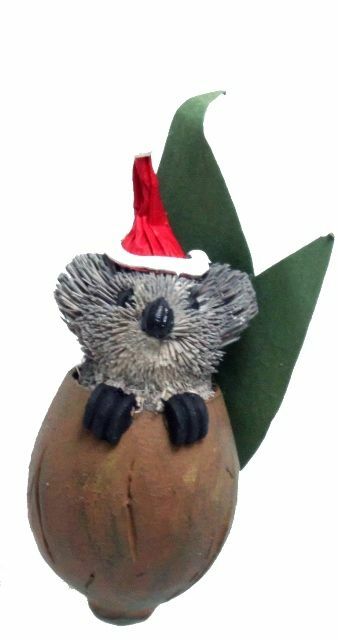 Our online store has a variety of native Australian wildlife for you to choose from and the animals in this collection are all dressed for Christmas! These animals look great on their own but will give your tree are real Australian flavour when it’s joined by other wildlife species such as the twin gumnut koala joeys, the Platypus, Little Penguin, Kangaroo, Kookaburra, Tawny Owl and more. These Aussie Christmas Ornaments are easy to hang, are perfect for wrapping up and sending out as a gift or use them with name tags to make each gift you give as unique as our Australian wildlife.